Aerial 360 photos and videos are among the most impressive uses of 360 photos. 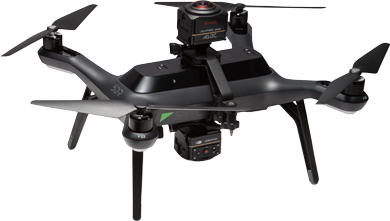 However, there are a lot of technical challenges involved, including the need to patch the image of the drone, which can occupy as much as half of a spherical photo or video. There are several ways to solve this issue. One way is to have a camera both below and above the drone. 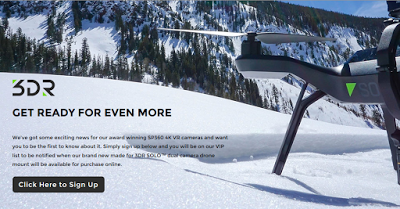 Kodak posted a teaser on their page about a dual camera drone mount for the Kodak SP 360 4k and the 3DR Solo drone. 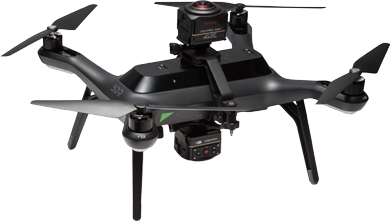 As you can see, it attaches two Kodak SP360 4k cameras to the drone. With both lenses facing away from the drone, the drone does not appear in the shot. The video from the cameras would need to be stitched. However, the SP360 4k already includes software for stitching two hemispherical videos into one fully spherical video. In the photo above, there does not appear to be a GoPro or gimbal. It is not clear whether the Kodak will connect with the 3DR’s controller to provide a live 360 feed.